Filament winding is idealy suited to making pipes so it is logical to look at winding Pipe fittings such as elbows, reducers and Tees. Reducers are a normal axisymmetric geometry that can be made with Cadfil-Axsym. Elbows have special software in the Cadfil-Elbow system and are quite simple for users to program. Cadfil was the first software system to fully program Tees using software only, prior to this manual and time consuming 'teaching' methods were used. The photo to the left was winding developed with Cadfil in the 1980's and demonstrated live at the 'K' show in Düsseldorf back in 1989! a) There must be a suitable blend radius between the two pipes to avoud fibre bridging off the mandrel surface over a wider range of paths. b) The width shape and length of the payout eye must be carefully designed to allow of optimum positioing realative to the branch (side pipe). c) The parallel portion on the branch should not be too long or indeed too short! d) The bandwidth will be smaller than what would normally be used with pipes of the same diameter which reduces material deposition rates. e) When winding around the branch the mandrel has both forward and reverse rotation which when coupled to the fact that the mandrel is often unbalanced leads to more work for the mandrel motors and slower winding speeds. f) Fibre twist conditions (and then untwist) can occur winding up and down the branch, the fibre delivery systems needs to be able to accomodate this. 1] Generate the mandrel surface definition and an envelope definition (see below). The envelope is a surface that is clear of the mandrel surface on which the machine will run without hitting the mandrel. 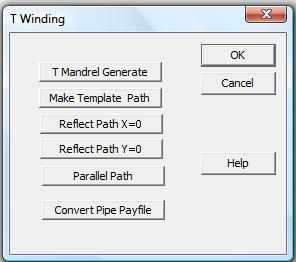 2] Create a 'template' winding path by steering it across the mandrel surface using 'friction'. (help topic "Tee Template Path"
3] Expand the template path (if required) using the symmetry tools as the T has 2 distinct symmetry planes. 4] Replicated paths parallel to the original path separated by a distance that is the bandwidth of the fibres. 5] Process the paths on the mandrel surface to create the 3D machine path (payout path) on the clearance envelope (surfaces). 6] Post-Process the payout to create instructions for the winding machine. 7] It is also possible to generate standard pipe winding programs for the cross piece. This can be modified and 'attached' to the T mandrel using a specific T option. 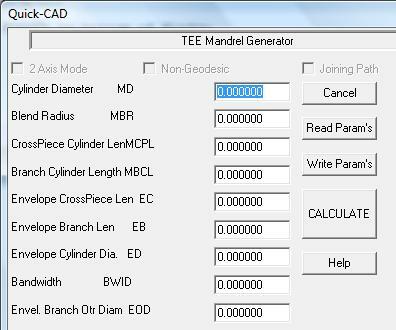 From the T Winding options pick the 'T Mandrel generate' Button. 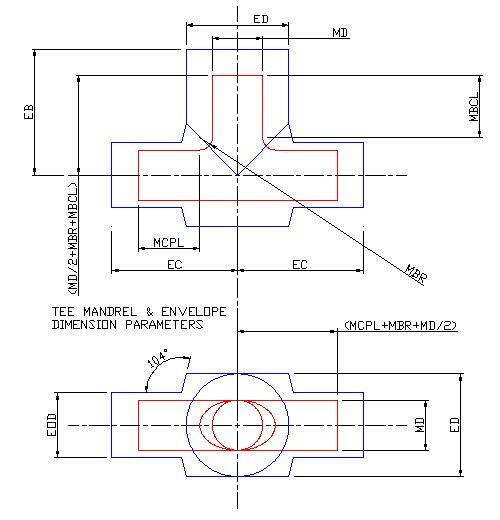 The figure below shows the T mandrel and envelope dimensions the actual dimension values in mm or inch are entered in a windows dialog also shown below. Note that the cross-piece pipe and branch pipes are the same diameter. This is the length outside the blend area at each end (see diagram). The Cross piece total length is 2*MCPL+2*MBR+MD. This is the length of the branch above the blend area (see diagram). Envelope Cross piece length EC. This is for the machine clearance, refer to the diagram. If the position of the machine wants to be further away (in length) from the mandrel centre the machine will then move on a circular plane at the end of the envelope. Caution is required as shaft collision could occur. This can be checked in the payout viewing options or in the post-processor output. EC must be greater than MCPL+MBR+MD/2 to be clear of the end of the mandrel, typically add a mandrel diameter. This is for the machine clearance, refer to the diagram. If the position of the machine wants to be further away (in length) from the mandrel centre the machine will then move on a circular plane at the end of the envelope. This determines the furthest distance away the cross-feed axis will be from the winding axis. This is the width of the fibre band to be used and is saved associated with parameters in the mandrel data. Once entered the 'Write Params' option can be used to save the parameter data, for example to the file name1.par. This can be read back later using 'Read PArams' if there is a need to change the data. The 'calculate' button is clicked then to generate the mandrel data. You will be asked to give a name for the mandrel file, this will be saved with the .mnd extension, for example mytee1.mnd. After some calcualtion you will be asked for the mandrel name again it is best to use same name as the initial mandrel data has been processed further and is now not needed. The leg usually requires quite a large clearance diameter (ED) to allow for the width of the payout eye. For this reason the outer end of the POE needs to be as narrow as possible to allow a smaller clearance. The branch cylinder has the same clearance diameter (ED) around the intersection area however outside this area a smaller clearance can be used (EOD), this should be as small as is practical to stop excess program motion that can lead to a loss of fibre tension. The transition zone from ED to EOD is conical with an arbitrary gradient of 4 (76 degrees).